Native North American shrub ranging along the Pacific coast, member of the Rose family, Rosaceae. The shrub has 3 inch long oblong leaves with prominent veining. 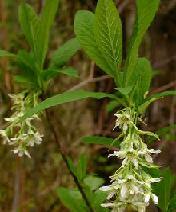 Blooming early in the spring, it bears pendulous white blooms which mature into dark purple edible berries. The shrubs thrive in ordinary soil under the canopy of other trees or in a partly shady location. They sucker freely and pruning is required to keep them neat. The fruits are consumed by wildlife and humans, being rather bitter with an almond flavor, though they do sweeten with age. Like almonds and apple seeds, they contain cyanide and should only be eaten in small quantities. The leaves are often consumed as a salad green, tasting a bit like cucumbers. Oemleria is easily propagated by sucker or sowing seed. Seed should be sown when ripe. Stored seed can be cold stratified for 90 days prior to sowing for best germination.